Pitch refers to how low or high a sound is and is measured in hertz (Hz) or kilohertz (kHz) (1,000 hertz equals 1 kilohertz). The higher hertz, the higher the pitch. The reason that pitch is measured in hertz is because sound waves oscillate (go up and down) a certain number of times per second, and hertz means times per second. Also, since pitch is measured in hertz, specific pitches can be referred to as frequencies. Although it is generally agreed that the range of frequencies people can hear starts at 20 Hz, there is disagreement over high this range goes. The upper limit of perceptible frequencies goes to 20 , 24 [2 page 8] , or 25 [4 page 5] kHz depending on who you ask. This upper limit tends to worsen with age. The audio frequencies that are directly perceptible by people are known as sonic frequencies. Frequencies below the sonic range are known as infrasonic, and frequencies above the sonic range are known as ultrasonic. Although there is some evidence that having ultrasonic frequencies reproduced in audio in conjunction with sonic frequencies may be beneficial , this remains a highly controversial claim. In fact, some argue that having ultrasonic frequencies in audio recordings will actually make them sound worse, not better  . 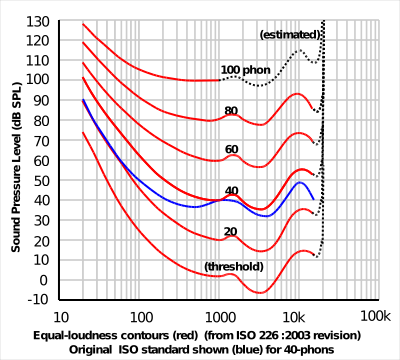 As you can see, 100 phons is the maximum loudness that ISO 226:2003 shows. 100 phons is roughly equivalent to the loudest levels produced by a symphonic orchestra in a concert hall [8 page 409]. Anything louder than this is both potentially uncomfortable [8 page 410] and, as the next section describes, potentially dangerous. One thing to notice is that 8-hour safety limit starting at 85 dBA gets cut in half for every 3 dBA increase. This is because a 3 dBA exchange rate is being used, which means that every 3 dBA increase is viewed as creating twice as much sound and thus half the allowed exposure time [10 page v] . 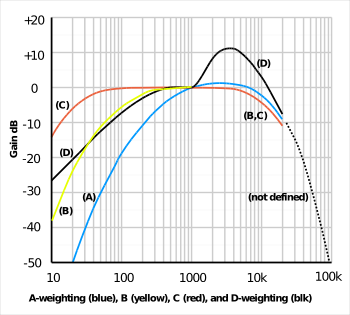 When discussing the concept of dynamic range, there are really three different concepts to talk about: the dynamic range of human hearing, the dynamic range of live or recorded audio, and the dynamic range of audio equipment and formats. As you can see from ISO 226:2003, the dB levels that most people would find tolerable range from a bit over -10 dB to a bit under 130 dB. This is why it is sometimes said that human hearing has a maximum dynamic range of 140 dB. This figure is sometimes described as a lower number, however, if the person describing dynamic range is looking at a smaller range of frequencies rather than all of the frequencies or if the person is trying to be more precise. The dynamic range of live or recorded audio is the difference between the smallest and loudest dB levels used. The dynamic range of audio equipment and formats is how many dB levels can be reproduced. THX, a company developed by George Lucas and audio scientist Tomlinson Holman, certifies certain audio and video products as being THX Certified . A product must meet a variety of criteria to be THX Certified . For audio products, one of the most important criteria for being THX Certified is that the audio product doesn't experience problems when playing back audio at the THX Reference Level   . The THX Reference Level is 105 dBC  and is indicated by a volume level of "0" on a THX Certified receiver  . THX Loudness Plus, a feature present in THX Ultra2 Plus and THX Select2 Plus receivers, is a technology designed to maintain correct audio output at lower volumes . 1. Monty. 24/192 Music Downloads... and why they make no sense. Mar. 1, 2012. Updated Mar. 25, 2012. Xiph.Org. ©2012 Red Hat Inc. and Xiph.Org. 2. AES project report for professional audio - Specifications for audio on high-capacity media. 1997. ©1998 by the Audio Engineering Society. Mar. 31, 1999 printing. 3. Matteo Milani. An interview with Tomlinson Holman, pt. 3. Apr. 22, 2009. Unidentified Sound Object Project. 4. A Proposal for the High-Quality Audio Application of High-Density CD Carriers. Jan. 1, 1996 - Version 1.3. ©1995, 1996 J.R. Stuart for Acoustic Renaissance for Audio. 5. Tsutomu Oohashi and others. Inaudible High-Frequency Sounds Affect Brain Activity: Hypersonic Effect. 2000. ©2013 the American Physiological Society. 6. Dan Lavry. Sampling Theory For Digital Audio. ©Dan Lavry, Lavry Engineering, Inc, 2004. 7. Equal-Loudness Contours. ©2000-2013 Lindos Electronics. 8. Helmet-mounted displays: Sensation, perception and cognition issues. 2009. U.S. Army Aeromedical Research Laboratory. 9. A-weighting in detail. ©2000-2013 Lindos Electronics. 10. NIOSH Publication No. 98-126, Criteria for a Recommended Standard, Occupational Noise Exposure, Revised Criteria 1998. June 1998. National Institute for Occupational Safety and Health. 11. Facts and Statistics. NOISE AND HEARING LOSS PREVENTION. May 10, 2011. Updated July 28, 2011. National Institute for Occupational Safety and Health. 12. The THX Story. ©2013 THX Ltd.
13. How Do Products Get THX Certified?. ©2013 THX Ltd.
14. THX Reference Level. ©2013 THX Ltd.
15. THX Certified Receivers. ©2013 THX Ltd.
16. THX Certified Speakers. ©2013 THX Ltd.
17. THX® UNVEILS NEW THX COMPACT SPEAKER SYSTEM™ CERTIFICATION PROGRAM TO MEET CONSUMER DEMAND FOR HIGHER-QUALITY SOUND IN SMALLER ROOMS. Jan. 10, 2012. ©2013 THX Ltd.
18. THX Loudness Plus. ©2013 THX Ltd.